According to certain Jewish mystics, Moses ascended Mount Sinai three times, remaining in the presence of God forty days each time. During the first forty days the tables of the written law were delivered to the prophet; during the second forty days he received the soul of the law; and during the last forty days God instructed him in the mysteries of the Qabbalah, the soul of the soul of the law. Moses concealed in the first four books of the Pentateuch the secret instructions that God had given him, and for centuries students of Qabbalism. have sought therein the secret doctrine of Israel. As the spiritual nature of man is concealed in his physical body, so the unwritten law--the Mishna and the Qabbalah--is concealed within the written teachings of the Mosaic code. Qabbalah means the secret or hidden tradition, the unwritten law, and according to an early Rabbi, it was delivered to man in order that through the aid of its abstruse principles he might learn to understand the mystery of both the universe about him and the universe within him. The Sepher ha Zohar presumably was written by Simeon ben Jochai, a disciple of Akiba. Rabbi Simeon was sentenced to death about A.D. 161 by Lucius Verus, co-regent of the Emperor Marc Aurelius Antoninus. He escaped with his son and, hiding in a cave, transcribed the manuscript of the Zohar with the assistance of Elias, who appeared to them at intervals. Simeon was twelve years in the cave, during which time he evolved the complicated symbolism of the "Greater Face" and the "Lesser Face." While discoursing with disciples Rabbi Simeon expired, and the "Lamp of Israel" was extinguished. His death and burial were accompanied by many supernatural phenomena. The legend goes on to relate that the secret doctrines of Qabbalism had been in existence since the beginning of the world, but that Rabbi Simeon was the first man permitted to reduce them to writing. Twelve hundred years later the books which he had compiled were discovered and published for the benefit of humanity by Moses de León. The probability is that Moses de León himself compiled the Zohar about A.D. 1305, drawing his material from the unwritten secrets of earlier Jewish mystics. The Apocalypse, accredited to St. John the Divine, is also of uncertain date, and the identity of its author has never been satisfactorily proved. Because of its brevity and because it is the key to Qabbalistic thought, the Sepher Yetzirah is reproduced in full in this chapter. So far as is known, the Sepher ha Zohar has never been completely translated into English, but it can be obtained in French. (S. L. MacGregor-Mathers translated three books of the Zohar into English.) The Zohar contains a vast number of philosophical tenets, and a paraphrase of its salient points is embodied in this work. The theories of Qabbalism are inextricably interwoven with the tenets of alchemy, Hermeticism, Rosicrucianism, and Freemasonry. The words Qabbalism and Hermeticism are now considered as synonymous terms covering all the arcana and esotericism of antiquity. The simple Qabbalism of the first centuries of the Christian Era gradually evolved into an elaborate theological system, which became so involved that it was next to impossible to comprehend its dogma. The Qabbalists divided the uses of their sacred science into five sections. The Natural Qabbalah was used solely to assist the investigator in his study of Nature's mysteries. The Analogical Qabbalah was formulated to exhibit the relationship which exists between all things in Nature, and it revealed to the wise that all creatures and substances were one in essence, and that man--the Little Universe--was a replica in miniature of God--the Great Universe. The Contemplative Qabbalah was evolved for the purpose of revealing through the higher intellectual faculties the mysteries of the celestial spheres. By its aid the abstract reasoning faculties cognized the measureless planes of infinity and learned to know the creatures existing within them. The Astrological Qabbalah instructed those who studied its lore in the power, magnitude, and actual substance of the sidereal bodies, and also revealed the mystical constitution of the planet itself. The fifth, or Magical Qabbalah, was studied by such as desired to gain control over the demons and subhuman intelligences of the invisible worlds. It was also highly valued as a method of healing the sick by talismans, amulets, charms, and invocations. At hand also was a manuscript copy in English of the Book of the Cabalistick Art, by Doctor John Pistor. The document is undated; but judging from the general type of the writing, the copy was made during the eighteenth century. The third volume used as a reference was the Sepher Yetzirah, by the late Win. Wynn Westcott, Magus of the Rosicrucian Society of England. The fourth was the Sepher Yetzirah, or The Book of Creation, according to the translation in the Sacred Books and Early Literature of the East, edited by Prof. Charles F. Horne. The fifth was a recent publication, The Book of Formation, by Knut Stenring, containing an introduction by Arthur Edward Waite. At hand also were four other copies--two German, one Hebrew, and one Latin. Certain portions of the Sepher Yetzirah are considered older and more authentic than the rest, bur the controversy regarding them is involved and nonproductive that it is useless to add further comment. The doubtful passages are therefore included in the document at the points where they would naturally fall. 1. YAH, the Lord of Hosts, the living Elohim, King of the Universe, Omnipotent, the Merciful and Gracious God, Supreme and Extolled, Dweller in the Height whose habitation is Eternity, who is Sublime and Most-Holy, engraved His name and ordained (formed) and created the Universe in thirty-two mysterious paths (stages) of wisdom (science), by three Sepharim, namely, Numbers, Letters, and Sounds, which are in Him one and the same. 2. Ten Sephiroth (ten properties from the Ineffable One) and twenty-two letters are the Foundation of all things. Of these twenty-two letters three are called "Mothers," sewn "Double," and twelve "Simple." 3. The ten numbers (Sephiroth) out of Nothing are analogous to the ten fingers and the ten toes: five over against five. In the center between them is the covenant with the Only One God. In the spiritual world it is the covenant of the voice (the Word), and in the corporeal world the circumcision of the flesh (the rite of Abraham). 4. Ten are the numbers (of the Sephiroth) out of Nothing, ten--not nine; ten--not eleven. Comprehend this great, wisdom, understand this knowledge and be wise. Inquire into the mystery and ponder it. Examine all things by means of the ten Sephiroth. Restore the Word to Its Creator and lead the Creator back to His throne again. He is the only Formator and beside Him there is no other. His attributes are ten and are without limit. 6. The appearance of the ten spheres (Sephiroth) out of Nothing is as a flash of lightning or a sparkling flame, and they are without beginning or end. The Word of God is in them when they go forth and when they return. They run by His order like a whirlwind and prostrate themselves before His throne. 7. The ten Sephiroth have their end linked to their beginning and their beginning linked to their end, cojoined as the flame is wedded to the live coal, for the Lord is Superlatively One and to Him there is no second. Before One what can you count? 2nd. He produced air from the spirit and in the air. He formed and established twenty-two sounds--the letters. Three of them were fundamental, or mothers; seven were double; and twelve were simple (single); but the spirit is the first one and above all. 5th. He selected three consonants (I, H, V) from the simple ones--a secret belonging to the three mothers, or first elements; א מ ש (A, M, Sh), air, water, fire (ether). He sealed them with His spirit and fashioned them into a Great Name and with this sealed the universe in six directions. He turned towards the above and sealed the height with י ה ו (I, H, V). 10. These are the ten ineffable existences out of nothing; From the spirit of the Living God emanated air; from the air, water; from the water, fire (ether); from the fire, the height and the depth, the East and the West, the North and the South. 2. The twenty-two basic letters having been designed, appointed, and established by God, He combined, weighed, and exchanged them (each with the others), and formed by them all beings which are in existence, and all which will be formed in time to come. 3. He established twenty-two basic letters, formed by the voice and impressed upon the air by the breath. He set them to be audibly uttered in five different parts of the human mouth: namely, Gutturals, א ה ח ע; Palatals, ג י כ ק; Linguals, ד ט ל נ ת Dentals, ז ש ס ר ץ; Labials, ב ו מ ף. 4. He fixed the twenty-two basic letters in a ring (sphere) like a wall with two hundred and thirty-one gates, and turned the sphere forward and backward. Turned forward, the sphere signified good; when reversed, evil. Three letters may serve for an illustration: There is nothing better than ע נ ג (O, N, G), pleasure (joy), and nothing worse than נ ג ע (N, G, O), plague (sorrow). 5. How was it all accomplished? He combined, weighed, and changed: the א (A) with all the other letters in succession, and all the others again with א (A), and all again with ב (B); and so with the whole series of letters. 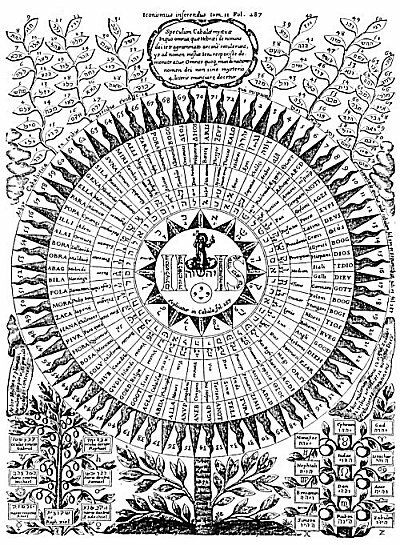 Hence it follows that there are two hundred and thirty-one formations, or gates, through which the powers of the letters go forth; every creature and every language proceeded from One Name and the combinations of its letters. 6. He created a reality out of Nothing. He called the nonentity into existence and hewed colossal pillars from intangible air. This has been shown by the example of combining the letter א (A) with all the other letters, and all the other letters with א. By speaking He created every creature and every word by the power of One Name. As an illustration, consider the twenty-two elementary substances from the primitive substance of א. The production of every creature from the twenty-two letters is proof that they are in reality the twenty-two parts of one living body. 1. The first three elements (the Mother letters, א מ ש) resemble a balance, in one scale virtue and in the other vice, placed in equilibrium by the tongue. 2. 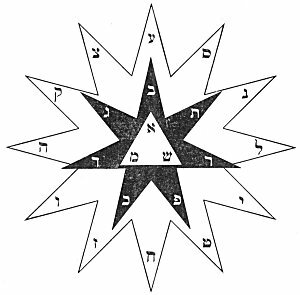 The three Mothers, א מ ש, enclose a great, wonderful, and unknown mystery, and are sealed by six wings (or elementary circles), namely, air, water, fire--each divided into an active and a passive power. The Mothers, א מ ש, gave birth to the Fathers (the progenitors), and these gave birth to the generations. 3. God appointed and established three Mothers, א מ ש, combined, weighed, and exchanged them, forming by them three Mothers, in the universe, in the year, and in man (male and female). 4. The three Mothers, א מ ש, in the universe are: air, water, and fire. Heaven was created from the elementary fire (or ether) ש, the earth, comprising sea and land, from the elementary water, מ, and the atmospheric air from the elementary air, or spirit, א, which establishes the balance among them. Thus were all things produced. 5. The three Mothers, א מ ש, produce in the year heat, coldness, and the temperate state. Heat was created from fire, coldness from water, and the temperate state from air, which equilibrates them. 6. The three Mothers, א מ ש, produce in man (male and female) breast, abdomen, and head. 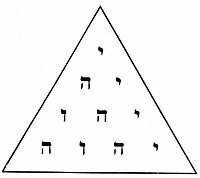 The head was formed from the fire, ש; the abdomen from the water, מ; and the breast (thorax) from air, א, which places them in equilibrium. 7. God let the letter א (A) predominate in primordial air, crowned it, combined it with the other two, and sealed the air in the universe, the temperate state in the year, and the breast in man (male and female). 8. He let the letter מ (M) predominate in primordial water, crowned it, combined it with the other two, and sealed the earth in the universe (including land and sea), coldness in the year, and the abdomen in man (male and female). 9. He let the letter ש (Sh) predominate in primordial fire, crowned it, combined it with the other two, and sealed heaven in the universe, heat in the year, and the head of man (male and female). 1. The seven double letters, ב ג ד כ פ ר ת (B, G, D, K, P, R, Th), have a duplicity of pronunciation (two voices), aspirated and unaspirated, namely: פּ ת, רּ ר, פּ פ, כּ כ, דּ ד, גּ גThey serve as a model of softness and hardness, strength and weakness. 2. The seven double letters symbolize wisdom, riches, fertility life, power, peace, and grace. 3. The seven double letters also signify the antitheses to which human life is exposed. The opposite of wisdom is foolishness; of riches, poverty; of fertility, sterility; of life, death; of power, servitude; of peace, war; and of beauty, deformity. 4. The seven double letters point out the six dimensions, height, depth, East and West, North and South, and the Holy Temple in the center, which sustains them all. 5. The double letters are seven and not six, they are seven and not eight; reflect upon this fact, search into it and reveal its hidden mystery and place the Creator on His throne again. 6. The seven double letters having been designed, established, purified, weighed, and exchanged by God, He formed of them seven planets in the universe, seven days in the Year, and seven gateways of the senses in man (male and female). From these seven He also produced seven heavens, seven earths, and seven Sabbaths. Therefore He loved seven more than any other number beneath His throne. 7. The seven planets in the universe are: Saturn, Jupiter, Mars, Sun, Venus, Mercury, and Moon. The seven days in the Year are the seven days of the week (possibly the seven creative days are meant). The seven gateways in man (male and female) are two eyes, two ears, two nostrils, and the mouth. 8. NOTE. Knut Stenring differs from other authorities in his arrangement of the planets and days of the week in the following seven stanzas. Kircher has still a different order. Rev. Dr. Isidor Kalisch, Wm. Wynn Westcott, and The Sacred Books and Early Literature of the East adopt the following arrangement. In the central triangle are the three Mother Letters from which come forth the seven Double Letters--the planets and the heavens. Surrounding the black star are the signs of the zodiac symbolized by the twelve Simple Letters. In the midst of this star is the Invisible Throne of the Most Ancient of the Ancients--the Supreme Definitionless Creator. 9. With the seven double letters He also designed seven earths, seven heavens, seven continents, seven seas, seven rivers, seven deserts, seven days, seven weeks (from Passover to Pentecost), and in the midst of them His Holy Palace. There is a cycle of seven years and the seventh is the release year, and after seven release years is the Jubilee. For this reason God loves the number seven more than any other thing under the heavens. 10. In this manner God joined the seven double letters together. Two stones build two houses, three stones build six houses, four stones build twenty-four houses, five stones build 120 houses, six stones build 720 houses, and seven stones build 5,040 houses. Make a beginning according to this arrangement and reckon further than the mouth can express or the ear can hear. 1. The twelve simple letters ה ו ז ח ט י ל נ ס ע צ ק (H, V, Z, Ch, T, I, L, N, S, O, Tz, Q) symbolize the twelve fundamental properties: speech, thought, movement, sight, hearing, work, coition, smell, sleep, anger, taste (or swallowing), and mirth. 2. The simple letters correspond to twelve directions: east height, northeast, east depth; south height, southeast, south depth; west height, southwest, west depth; north height, northwest, north depth. They diverge to all eternity and are the arms of the universe. 3. The simple letters having been designed, established, weighed, and exchanged by God, He produced by them twelve zodiacal signs in the universe, twelve months in the year, and twelve chief organs in ` human body (male and female). 1. There are three Mothers or first elements, א מ ש (A, M, Sh), from which emanated three Fathers (progenitors)--primordial (spiritual) air, water, and fire--from which issued the seven planets (heavens) with their angels, and the twelve oblique points (zodiac). 2. To prove this there are three faithful witnesses: the universe, the year, and man. There are the twelve, the balance, and the seven. Above is the Dragon, below is the world, and lastly the heart of man; and in the midst is God who regulates them all. 3. The first elements are air, water, and fire; the fire is above, the water is below, and a breath of air establishes balance between them. The token is: the fire carries the water. The letterמ (M) is mute; ש (Sh) is hissing like fire; there is א (A) among them, a breath of air which reconciles the two. 4. The Dragon (Tali) is in the universe like a king upon his throne; the celestial sphere is in the year like a king in his empire; and the heart is in the body of men like a king in warfare. 5. God also set the opposites against each other: the good against the evil, and the evil against the good. Good proceeds from good, evil from evil; the good purifies the bad, the bad the good. The good is reserved for the good, and the evil for the wicked. 6. There are three of which each stands by itself: one is in the affirmative (filled with good), one is in the negative (filled with evil), and the third equilibrates them. 7. There are seven divided three against three, and one in the midst of them (balance). Twelve stand in warfare: three produce love and three hatred; three are life-givers and three are destroyers. 8. The three that cause love are the heart and the two ears; the three that produce hatred are the liver, the gall, and the tongues; the three life-givers are the two nostrils and the spleen; and the three destroyers are the mouth and the two lower openings of the body. Over all these rules God, the faithful king, from His holy habitation in all eternity. God is One above three, three are above seven, seven are above twelve, yet all are linked together. 9. There are twenty-two letters by which the I AM (YAH), the Lord of Hosts, Almighty and Eternal, designed and created by three Sepharim (Numbers, Letters, and Sounds) His universe, and formed by them all creatures and all those things that are yet to come. 10. When the Patriarch Abraham had comprehended the great truths, meditated upon them, and understood them perfectly, the Lord of the Universe (the Tetragrammaton) appeared to him, called him His friend, kissed him upon the head, and made with him a covenant. First, the covenant was between the ten fingers of his hands, which is the covenant of the tongue (spiritual); second, the covenant was between the ten toes of his feet, which is the covenant of circumcision (material); and God said of him, "Before Abraham bound the spirit of the twenty-two letters (the Thora) upon his tongue and God disclosed to him their secrets. God permitted the letters to be immersed in water, He burned them in the fire and imprinted them upon the winds. He distributed them among the seven planets and gave them to the twelve zodiacal signs.